Calls for auto glass repair in Los Angeles always increase during the summer months. More people traveling and doing outdoor activities creates room for errors, collisions and vandalism to motor vehicles. When damage to auto glass happens, there are two types of auto glass that can be installed. These are aftermarket and OE glass. PG Auto glass is now using OE glass for all replacements and adheres to auto manufacturer specifications, so that clients have peace of mind about the security and quality of the glasses. Daily commuting is required for most drivers and increased highway travel brings more risk for collisions and damage to auto glass. Damage to auto glass is very common, especially in collisions. Residents that have vehicles with damaged glass now have a reliable source to repairs with PG Los Angeles auto glass repair mobile services. Trained technicians arrive promptly to review damage and determine if glass replacement or a simple fix is required. The front, side and rear glass provides the support needed to protect every driver and passengers in the vehicle. Automobile glass undergoes testing in special laboratories to determine the compression rate of breakage due to damage and other impacts. OE safety glass is considered to be the strongest and most trusted glass, other than the glass installed by automakers. Both business clients and residential clients trust PG Auto Glass for fast, dependable and safe Los Angeles auto glass replacement services. Local business courier services are responsible for delivering the commodities that are used each day by other businesses and consumers. A courier or delivery truck that cannot meet scheduled deliveries or pickups due to glass damage affects many people. PG auto glass replacement in Los Angeles provides delivery trucks and other commercial vehicles on the road with reliable services. 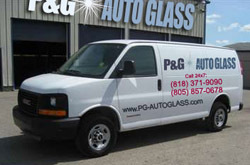 PG Auto Glass is the premier mobile glass replacement service in Los Angeles and surrounding areas. Professional equipment, technicians and installation experience comes directly to consumers and business owners that report glass damage to automobiles, RVs, municipal vehicles, state vehicles and company delivery trucks.